5 steps to buying a piece of Aboriginal art that suits you, including collecting tips. There are many styles of Aboriginal art, so the first step is to determine which styles appeal to you. Follow your intuition and select one that speaks to you personally and spiritually. Bark paintings. Thought to be the oldest form of Aboriginal art, most come from northern Australia. Common styles include cross-hatching ("rarrk") or X-ray, made from wood and ochre. Ochre paintings. Ochre colours are a range of browns, reds, sandy yellows, whites, greys, moody purples, and even greens, supplemented by black charcoal and ash, mostly mixed with a synthetic polymer emulsion to give durability and strength. Often these paintings depict traditional motifs and dreamtime stories. Sometimes elders prevent younger people from painting this style. History paintings. These are paintings that show contemporary issues and events, often in bright acrylic colours. Tourists don't like them much because they can be violent and confronting. Fibre art. Objects include everyday utensils, clothing, shelter, homewares, ceremonial artefacts, hunting materials and decorative items for day to day living. Woven products are quite well-known. Materials include bark, hair and grass. Aboriginal fashion textiles is another area with design techniques ranging from traditional fibre crafts to screen-printing, batik and hand-painting. Wood carvings and sculpture. 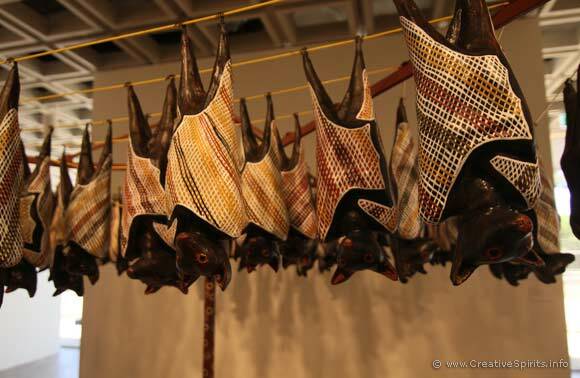 Some well-known artworks include Lin Onus' 'Fruit Bats' sculpture and Pukamani funeral poles from the Tiwi people. The Tiwi people live on Bathurst and Melville Islands, off northern Australia. Modern artists also work with bronze and aluminium. This category also includes Aboriginal beaded jewellery, burnt wire animals and carved objects such as boomerangs, didgeridoos or clap sticks. Paintings on canvas, linen or board. This art style is much more recent than you might assume. Artworks began to appear in the early 1970's with the Papunya Tula art movement where Aboriginal artists started to create dot paintings. Artists use a wide range of colours with the relatively easy medium of fast-drying acrylic paint. Watercolours. Made famous by Albert Namatjira, this style follows European artists and mainly focuses on the McDonnell Ranges and other central Australian landscapes. Urban art. Urban Aboriginal art is often very political, emotional and provocative. It frequently addresses contemporary issues of Aboriginal people. While you are in Australia, visit museums and art galleries to get a feeling for the different styles. If you are overseas, browse photos online. Go to the closest thing to your artist of choice – that is the artist representative – and see the artist’s solo exhibitions. They are the best way that you can judge the range of their work, and then pick the best one you can afford. You can also check out books about Aboriginal art or exhibition catalogues. Detail of Lin Onus' Fruit Bats sculpture. Note how the artwork combines the traditional style of cross-hatching with wood carving and a contemporary modern item, the clothes hoist. About 80% of shops that were investigated were selling artworks that were fake. They come from India, Indonesia and China. Ask the gallery how much of the artwork's purchase price goes back to the artist. The greater the percentage, the better. Read more about Aboriginal art authenticity. If you are buying souvenirs, the likelihood of buying imitations and fake art are very high. Is it attributed to an Australian artist? Does the label show information about the artist and origin of the item? Note that unlicensed Aboriginal art is very likely to offend the cultural keepers of its design, stories and copyrights. Step 3: Can you relate to the story? Most Aboriginal art comes with a story, because traditionally Aboriginal people told stories to convey their knowledge, and artwork supported them with that. Look at the strength of the meaning of the artwork as most artists try to include the stories of their Dreaming. Does it resonate with you? Can you find a part of your own story in the work? Ask the seller for documentation of the story to find out more details. Look at similar works by the same artist. And don't worry if there is no story, some works don't have one. I own a beautiful painting which, at the time of my purchase, was the only one without a story. It meant for me that I had to create my own story. That's right, walk away and reflect if you really want to buy that particular piece. Aboriginal art can be quite expensive and galleries are professional in trying to convince you to an impulse buy. If you are really in love with an artwork, pay a holding deposit and give yourself a few days, then return to make your decision. Talking to your partner is also helpful to make sure the two of you are aligned. Who benefits from the sale and who doesn't? What are the conditions under which the work was created? Some prisons sell artworks made by inmates. You might be able to purchase an artwork of good quality at a reasonable price. Check if a prison has an "art behind bars" program and which gallery sells its artworks. Ensure that the artwork that you have chosen is fairly sourced from artists and that the artists are treated fairly. Ethical standards apply whether you are buying from a gallery or dealer or from the artist direct. Ensure that the artist is paid a fair sum for their work and that you are not knowingly buying the art for too cheap a price. Also check if the artwork is authentic and correctly documented. It should not be made in China or by backpackers (all of which has happened). If you can (and want), buy directly from the artist or through Aboriginal-controlled and managed art centres and art fairs where the centres are selling directly to the public. Start small, do lots of research and develop an eye for good art. Visit as many galleries and exhibitions as possible and ask any questions, even if you think they are dumb. Research artists you like, to get to know more about their art. Start with works on paper or ceramics as they are cheaper. Take a risk on an emerging artist as they also tend to be cheaper. Beware of 'great art': just because a work is by a well-known artist does not make it a great example of their art. For affordable art loans, try Art Money or Tasmania's Collect Art Purchase Scheme. Pay off works off over time.